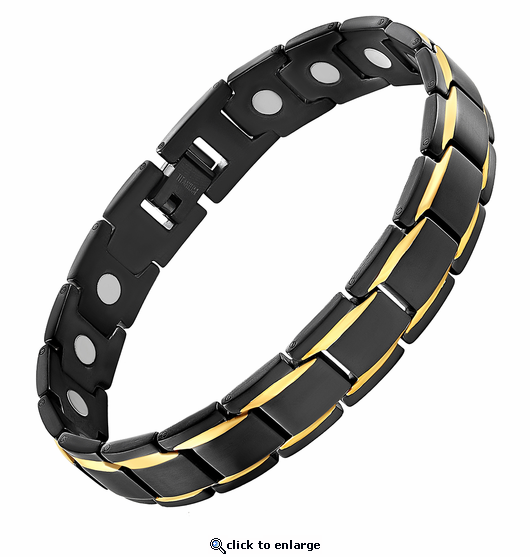 This stunning black titanium magnetic therapy bracelet is styled with shiny 18k gold stripes. Lightweight & durable, this titanium therapy bracelet has a powerful & permanent 3300 gauss neodymium rare earth bio north facing magnets in each link. Order yours today. I LOVE the bracelet. Stylish and nice fit. Pain in hand has abated somewhat. I have already recommended this product to others. I have not taken my magnetic bracelet off since I received it, since it is made of titanium I don't need to remove it to take a shower or anything else. Ever since I started wearing magnet bracelets I have no pain in my knee. Magnetic Jewlery is a great company to deal with. I will definitely order over and over from the Malgnetic Jewelry Store. The products are made well and as a customer, I have always been treated well. Love black and gold combination on anything and this bracelet is quite attractive. Have gotten several compliments. And the bracelet is functional, too. I have rheumatoid/osteoarthritis in both wrists and hands. If I don't wear the magnetic bracelets, my wrists become weak and painful. I do believe in magnets! I have now purchased a total of #3 therapy bracelets. All 3 have fit near perfect on my injured left wrist! The first 2 were the nice soft copper design, which I switched every other day from one to the other to keep them clean, as I have been a professional paint contractor for over 45 plus years. My damaged left wrist, and 3 of the left fingers were always aching and sore, and gradually got worse as I worked later into my adult life. I know for a specific fact, that the strong magnets that are located inside the bracelets, do for sure Help me and the pain of the injury, along with the additional slow but sure arthritis getting worse as I got older. Great product, great design, very good price point. Nothing negative too say about those first 2 copper bracelets. The newest Black Titanium bracelet fits totally perfect! It is a awesome looking piece, and it also has continued to assist and aid in my growing arthritis issues in that permanently damaged left hand and wrist. I was diagnosed a little over 4 and half months ago with terminal aml, acute myeloid leukemia. I will never ever be able to do a hard days painting work again, so I figured what is left of my time on this awesome place called earth, why not spend a little of my hard-earned cash, do a small price point upgrade, still have a very arthritic assisting bracelet, and also have a much more classy looking piece also! I really like everything about the Black Titanium, and the price is very fair once again. I will also use your site and store for all of my life final therapy bracelet needs, the customer service on the phone is great, the s/h is Free, extra fast s/h process and delivery, what is there Not to like and be pleased with? Thanks to your entire staff, do not change a thing in my opinion. I grew up working in my parents small rural farm town hardware store, exactly similar to an Ace Hardware. And I know and live and breathe Customer Service. When I got the bracelet in the mail and then put it on my left wrist I felt some of the pain I suffer with subside but there was still pain that was left and just enough to want to return it because it just was not strong enough. I emailed the company but never heard back. Then I had a thought and transferred the bracelet to my right wrist and almost immediately.I felt much pain relief. I always feel my magnets work immediately as I have been using them for over 20 yrs. So now I am wearing a bracelet on both wrists. Whatever works! But just wanted to say that I was given a free gift by this company and am grateful. It was one of their magnetic copper rings and I am wearing it and it does relieve arthritis pain in my thumb. Thank you very much for the ring...I probably would have never tried one on my own. Merchant's comment: We are glad to help if you contact us directly. We do reply to all emails received, but have no record of receiving your email. Our email is info@magnetjewelrystore.com. We are glad the bracelet has helped you. We do include instructions that suggest trying on each wrist. We are glad it helped. Very satisfied with this bracelet. Have not taken it off since I received it. I have had several compliments from other people on the style and look. Great bracelet, so light weight you hardly know you have it on and it receives lots of compliments on it stylish appearance. Love the simple style and overall look. Lightweight, handsome men's bracelet. Comfortable to wear during golf and workouts. Really good value!